"My husband is gluten free, so I made my mother's famous sugar cookies recipe gluten free, and they are the best homemade gluten-free cookies we've ever made. Perfect recipe for Christmas cookies!" Stir gluten-free flour, baking powder, xanthan gum, nutmeg, and salt together in a large bowl. Beat sugar and shortening with an electric mixer in a large bowl until smooth. Add beaten eggs, milk, and vanilla extract; beat until light and airy, about 2 minutes. Add gluten-free flour mixture in small batches and stir until dough is just combined. Pat dough into a ball, wrap in plastic wrap, and chill for at least 1 hour. Preheat oven to 375 degrees F (190 degrees C). Line 2 baking sheets with parchment paper. Dust rolling pin and cookie cutters with confectioners' sugar. Roll out dough to 1/2-inch thickness; cut cookies and place 2 inches apart onto the baking sheets. Whisk egg yolk with food coloring and water in a small bowl. 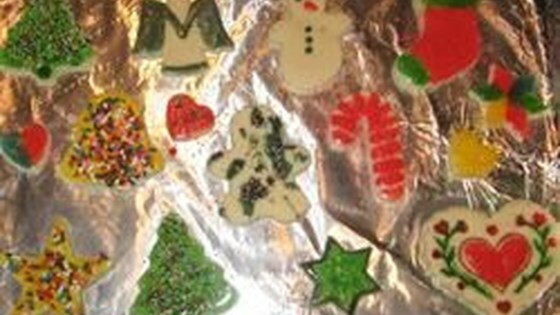 Decorate cookies with mixture using a child's paintbrush. Sprinkle sugar sprinkles on top. Bake in the the preheated oven until edges are golden, 8 to 12 minutes. Cool on the baking sheets for 1 minute before removing to a wire rack to cool completely. Optimal dough refrigeration would be for a minimum of 3 hours. Dough should be completely chilled when rolling out, otherwise it will stick to the rolling pin. If dough becomes sticky and hard to work with, rewrap in plastic wrap and refrigerate for another 30 minutes. To make additional "paint" colors, use 1 egg yolk per color.